Tux Hosting Review 2019: Is Tux Hosting a Good Hosting? 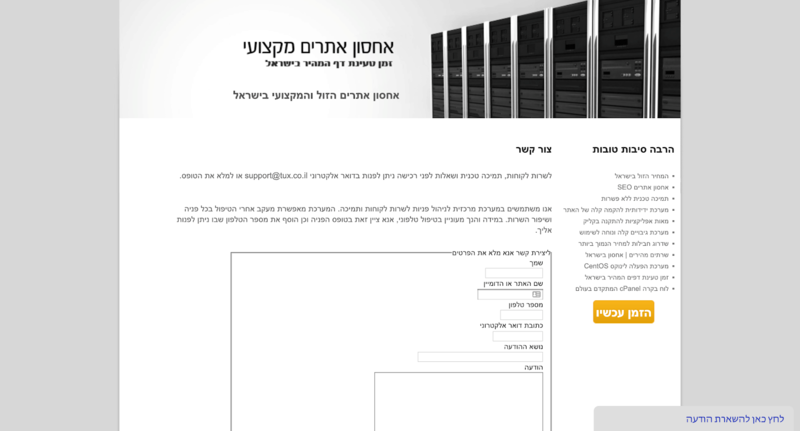 Tux Hosting offers SEO-specific web hosting packages for Israeli e-commerce merchants. Support for advanced programming languages is also available. Tux Hosting is a relatively new Israeli company staffed by a team with over ten years of experience in the industry. They specialize in providing SEO services to individuals, companies, and agencies. Interfacing and support options are in the Hebrew language only. Tux Hosting’s best feature is the ability to host an entire network of websites on their platform while assigning a separate IP address to each one. This gives webmasters looking to boost SEO the ability to build and interconnect multiple websites from a centralized location. Although SSL certificates are not offered with any plan, this inter-connectivity provides excellent opportunities for e-commerce companies to increase their search engine rankings. All Tux Hosting plans offer hundreds of integrations with popular applications including WordPress, Joomla, Magento, and Drupal. They also provide users with a website building tool. Unfortunately, there’s no specific mention of an uptime guarantee. In addition, all plans use the Linux CentOS operating system and are attached to a manual backup system to protect you against any server or hardware failures that may occur. One of the key things that sets Tux Hosting apart for e-commerce merchants is not just how many websites you can host on a single plan, but how many different domains and IP addresses you get access to. The entry-level plan offers a single domain and IP address, which can be increased up to the highest-tier plan with 60 different domains and 20 different IP addresses. There are four different plans to choose from. All plans come with unlimited data traffic, FTP accounts, email accounts, and MySQL databases. The entry-level plan offers 250MB of storage, which goes all the way up to 4GB at the highest tier. The 4GB limit is not going to be enough for large merchants, but should be adequate for entry-level and medium-sized merchants. The price-to-value ratio is a mixed bag. Upgrading from the lowest-tier to the highest-tier plan is a more than tenfold increase in price for a 16x increase in storage, but there’s no indication that speeds will increase. You do get a significantly larger number of domains and IP addresses, but when considering that with the highest-tier plan each domain will only have about 16MB of space to work with, it seems rather stingy. Overall, I’d say Tux Hosting is only suitable for webmasters looking to build a network of websites with low to mid-range performance capabilities. Support is below average. There’s a live chat option that I was able to speak with and get answers to basic questions. A ticketing system is available as well, but it can take a day or two to get a response. Although you can submit your phone number with the ticket, there is no direct phone support number available. There is also no knowledge base. Tux Hosting is a good option for webmasters running multiple, inter-connected websites they want to manage from a centralized location. However, the lack of an uptime guarantee and below average performance caps means those looking to build a single, large website will most likely need to look elsewhere. Wondering how Tux Hosting stacks up against other Web Hosting companies? Enter any other Web Hosting company and we will give you a side-by-side comparison.